Working as a priest sometimes offers a perspective available to no one else. I’m not even speaking here about the privilege of serving the Divine Liturgy, of standing before the throne of God in the moments of the celebration of the Eucharist. This is a joy beyond all description. But, even beyond performing the Liturgy, the priesthood has certain exclusive opportunities for discovering humanity and the world that those outside the priesthood cannot even begin to contemplate. Often during the last minutes of the life on earth of a Christian, his or her priest is with the doctor. But the priest is the only witness of the last confession. I am not speaking about what the dying person specifically repents of: people’s sins are usually fairly similar. But the priest gets to be a witness, and even sometimes a participant, in the remarkable event of the revelation of God’s will to a person. In the Agrapha or sayings of Christ it is written, “In whatsoever things I apprehend you, in those I will judge you.” The clergy has long believed that if before a person’s death he is able to take Holy Communion, that person’s soul immediately goes up to God, without undergoing any ordeals after death. I have often been struck by how various persons (of whom there are quite a few examples) could go to church all their life and even be monks, or priests, or even bishops, and yet somehow circumstances before their death were such that they died before receiving Communion. Others never went to church at all, and lived as unbelievers, and yet in their final days they not only revealed true deep faith and repentance, but, even beyond all expectations, the Lord vouchsafed them Communion of His Body and Blood. In the fall of 1994 my classmate from film school, Dmitri Talankin, visited me in the Sretensky Monastery. We hadn’t seen each other for many years, but he brought sad news. Our former professor, the great actor and film director Sergei Fyodorovich Bondarchuk (winner of the 1968 Best Foreign Film Oscar for his monumental epic War and Peace), was dying and near death already. Bondarchuk was a friend of Dmitri’s family, and so Dmitri sought me out to hear his confession and give him Communion before his death. I hadn’t seen Sergei Fyodorovich since my student days, but I knew that his recent years had been darkened by harassment and persecution by colleagues in the movie industry. He had endured it all stoically. Bondarchuk was not only extremely versatile in his talents, but also a very strong and courageous man. However, his health had become irreparably frail. As for the spiritual life of Sergei Fyodorovich, he had been baptized in childhood, but then he had been educated and had lived in an atheist environment. Only in his final years had he come to some understanding of God. But his religious teachings had been gained not from the Church, but from the religious writings of Leo Tolstoy, whose genius he revered. As is well known, Tolstoy at the end of the nineteenth century offered the world a religion that he had basically created for himself. Several genera­tions of Russian intellectuals went through the temptations of Tolstoyan mysticism. Many of them transformed their relationship to their idol into something akin to real religious reverence. Dmitri told me that in the past few weeks Sergei Fyodorovich’s physical sufferings had been aggravated further by strange spiritual torments. He was receiving “visitations” from long-dead people whom he had known well, famous actors and colleagues in the movie industry, appearing before him as if real. But now they were appearing before him in the most monstrous and horrific forms possible, tormenting the patient, and giving him no rest either by day or night. His physicians tried to help him, but without success. Tormented by nightmares, Sergei Fyodorovich tried to find refuge in the religion of Tolstoy. But the strange visitations tormenting his consciousness only became worse and tortured him even further. I was met in the Bondarchuk apartment by Sergei Fyodorovich’s wife, Irina Konstantinovna Skobtseva, and their children, Alyona and Fedya. A melancholy gloom had settled over their home. Everyone seemed to be weighed down by suffering, and not just the dying man, but all his family as well. Sergei Fyodorovich was lying in a spacious bedroom whose curtains had been tightly drawn. His illness had changed him visibly. Across from the bed, looking right at the patient, there hung a large and beautifully executed portrait of Tolstoy. After greeting Sergei Fyodorovich, I sat by his bedside and could not at first even begin to find the words to express our gratitude as graduates of the National State Cinematic Institute for our beautiful memories of his lectures. Happy to hear of my gratitude, Sergei Fyodorovich gratefully clasped my hand. This cheered me up, and I was encouraged to proceed to the main goal of my visit. I said that I had come in order to remind him of the precious teaching that is kept and passed on by the Church from generation to generation. The Christian Church does not only believe, but absolutely knows that physical death is not by any means the end of our existence, but is instead the beginning of a new life for which the person is predestined. This new life is endless and is open to those who have filled themselves with God our Lord, Jesus Christ. I told Bondarchuk about the beautiful and remarkable world after death that is endlessly good and full of light to which our Savior will lead anyone who trusts himself unto Him with all his heart. And I told him that one needs to prepare for this great event of dying and transition into a new life. As for the horrible visions that had so cruelly been torturing the patient, I tried here to set forth the basic teachings and experience of the Church about the reality of the influence upon us of the evil spirits. Modern man has difficulty accepting this theme. However, Sergei Fyodorovich had clearly felt the reality of the presence in our world of these pitiless spiritual entities for himself, and so he listened to me with great attention. At the threshold of death, once someone approaches the boundaries between this world and the next world, the previously impermeable barrier between the two worlds can dissolve. Unexpectedly one can begin to see a new reality. One of the greatest shocks is often the fact that this revealed new reality can be aggressive and truly awful. People who are separated from the Church do not understand that because of their sins and passions for which they have not yet repented, they can be prey for these evil spiritual entities, which the Orthodox Church calls demons. These demons were in fact torturing the dying man, partly by taking on the visages of persons whom he had once known. The goal of these demons is to frighten us, to make us feel terror, powerlessness, and utter despair. Their goal is to make sure that the soul passes into the other world in an agonized state of hopelessness, despair, and the absence of belief in God or any hope of salvation. Sergei Fyodorovich listened to all of this with noticeable emotion. It was plain that he had already understood and thought about much of what I said. When I finished, Sergei Fyodorovich said that he wished to confess his sins with a full heart and to receive the Holy Mysteries of Christ. Before I could remain alone with him there were two important things I needed to do. The first was fairly easy: Alyona and I opened the heavy curtains and let the sunshine stream into the room through the windows. Then I stepped out with Sergei Fyodorovich’s family into another room and closed the door. I explained to them as best I could that the ceaseless grieving and despair of his loved ones only worsens the spiritual pain of a dying man. When someone we love goes into another life, of course, this is a sad event, but it is not by any means a cause for despair. Death is not only an occasion for grief about the person who is leaving us behind, but also a sacred moment for us Christians, because it is the transition to a new life. Our role was to help him get ready for that most important of transitions with all of our energies. And therefore we absolutely should not present ourselves to him in mourning and despair. I asked Irina Konstantinova and Alyona to prepare a celebratory meal, and bid Fedya to deck the table with the best drinks available in the house. I went back to Sergei Fyodorovich and told him that now we would get ready for the confession and Communion. “But I have no idea how that’s done,” Bondarchuk admitted to me confidentially. “Sergei Fyodorovich!” I broke in heatedly. “Tolstoy was a wonderful and great writer! But he will never be able to defend you from these horrible visions! Only the Lord can do that!” Bondarchuk nodded. It was time to prepare for the sacraments of confession and Commu­nion. However, as before, the portrait of his beloved genius was on the wall opposite him like an icon. There was no way that I could place the gifts of the Eucharist for Communion on the commode beneath the portrait of that writer. It was unthinkable! In life, Tolstoy had not only refused to believe in the sacraments of the Church, but he had openly and cruelly mocked them. Indeed, he had with particular refinements satirized even the very sacrament of Communion. Bondarchuk knew and understood all this no less than I did. With his permission I carried the portrait into the living room. And this was the second important thing that needed to be done. The Bondarchuk family had an ancient icon of the Savior in a tarnished silver frame. Fedya and I placed it in front of Sergei Fyodorovich’s eyes, and he finally, leaving behind all that was temporal and temporary, fulfilled the sacrament to which the Lord by His Providence had been leading him for years and decades. Bondarchuk confessed before God all the sins of his life profoundly, courageously, and sincerely. After this the whole family walked into the room, and Sergei Fyodorovich, for the first time since distant childhood, partook of the Holy Mysteries of Christ. Everyone was amazed with what feeling he did this. Even the expres­sion of pain and suffering that had never gone from his face had suddenly vanished. Having completed our main task, we set a beautiful table for a feast right by the bedside of the patient. Fedya poured everyone a little bit of red wine as well as some of his father’s oldest and best cognac. We had a real peaceful and joyful feast, as we congratulated Sergei Fyodorovich with his first Communion since so long ago, and the upcoming mysterious journey or “the way of all flesh” on which he was soon destined to embark. Before I left I had another moment alone with Sergei Fyodorovich. I wrote a simple Jesus Prayer on a little piece of paper and left it in front of him: “Lord Jesus Christ, Son of God, have mercy on me, a sinner.” Sergei Fyodorovich did not know any prayers. And of course in his condition he could not learn anything more complicated. But nothing more complicated was needed. Then I removed my monastic prayer rope from my own arm and taught Sergei Fyodorovich how to use it. And we said goodbye. Several days passed. Alyona Bondarchuk called me and told me that her father’s condition had changed markedly. He was no longer being tormented by dreadful visions. He had calmed down and was somehow visibly resigned from suffering in this world. Alyona told me that she often saw how her father would be lying there staring for hours at the icon of the Savior, or, having closed his eyes, whispering a prayer at each knot of his prayer rope. Sometimes he would press the little cross at the end of the prayer rope to his lips. This meant that his physical pain was becoming unbearable. Another week went by. I was invited by the chief of the department of neurosurgery of the Moscow Province Hospital to bless the operating room and intensive care unit. When I got there in the morning, Dmitri Talankin and Fedya Bondarchuk were waiting for me. Sergei Fyodorovich had been brought to the Central Clinical Hospital, where the doctors had declared that he might die any day now. I had the Holy Gifts of the Eucharist with me, ready to give Holy Communion to the sick, and we immediately went to the Central Clinical Hospital. 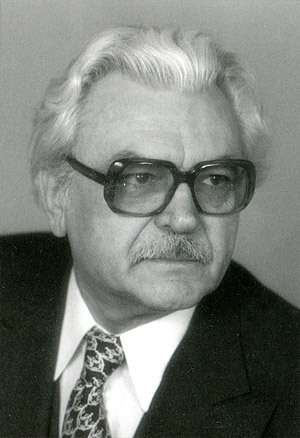 Sergei Fyodorovich was suffering unbearably. When I came up to him he opened his eyes slightly to let me know that he recognized me. He had the prayer rope in his hand. I asked him if he wished to receive Communion. Sergei Fyodorovich nodded, almost imperceptibly. He was already unable to speak. I read the prayer of absolution of sins over him and gave him Communion. Then his whole family and I kneeled by his bedside as we read the Canon for the Departure of the Soul. The Church has one particular prayer and rite that is known as “when a person suffers very long in sickness.” This prayer is read if the soul of the dying person is taking a long and torturous time to leave the body. It is used when a person wants to but cannot die. When I saw the state the patient was in, I read this prayer right by his pillow. In this prayer the Church commends its son into the hands of God, asking that he be freed of suffering and worldly cares in this temporal life. Making the sign of the cross over Sergei Fyodorovich for the last time, I bade him farewell. Dmitri Talankin and I departed the hospital room, leaving the dying man in the company of his family. No matter how sad the sight of the sufferings of someone about to die, life has its own demands. Dmitri and I had not had a single bite to eat all day. Therefore we decided to go to Dmitri’s family’s home on Mosfilm Street. We were met at the doorstep by Dmitri’s parents Igor Vasilyevich and Liliya Mikhailovna, who were in tears. Alyona had just telephoned them to say that Sergei Fyodorovich was no more. Right there and then in the apartment we served the Orthodox requiem. Perhaps we could end the story of the Christian death of the remarkable man and great artist Sergei Fyodorovich Bondarchuk on this note—were it not for one highly unusual occurrence that was conveyed to us by Dmitri’s parents. To be honest, I thought for a long time about whether it is even worth telling you this detail. I do not know how even churchgoers will be willing to accept the story Dmitri’s parents told us. Will they not just dismiss it as a fantasy—or perhaps just coincidence? But in the end, this story was and shall remain a sacred family story known to the Talankin family, and they authorized me to relate it. Surprised by this, the husband and wife walked out onto their balcony and beheld a scene the likes of which they had never laid eyes on before. The sky was choked by a black cloud of birds. Their sharp cries had become unbearable. The balcony looked out on a wooded park and onto the hospital where, as the Talankin family knew, their friend lay dying. The numberless horde of birds was absurd invention. But for those who undergo these events, they will always be a genuine revelation, completely changing their entire lives and outlooks on the world. I will therefore not edit out the detail from my chronicling of that day. 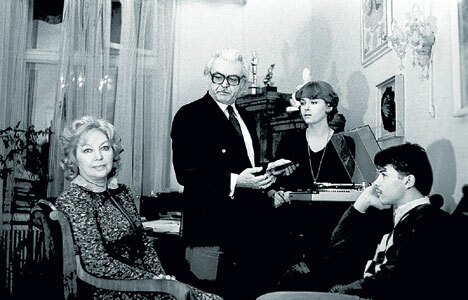 And I will convey all that was related to me by two absolutely heal­thy and normal people—the People’s Artist of the Soviet Union, celebrated director Igor Vasilyevich Talankin, and his wife, professor Liliya Mikhail­ovna Talankina—exactly as Dmitri and I heard it. He said it and was himself surprised by what he had said. The flock of birds flew up over them, and disappeared among the clouds hanging over Moscow. Several minutes later Alyona called. Everything that happened on that day—both the death of Sergei Fyodorovich, and the strange sight that happened at the moment of his death—Igor and Liliya Talankin conceived of as a message to them from their dying friend. No one was able to convince them otherwise— not friends, not Dmitri and I, nor even their own intellectual skepticism. Although, as far as I can remember, the Talankin family never again told any kind of stories of any events that might have anything to do with mysticism. I had the fortune to baptize them, and gradually they became Christians of deep and devout faith. The prayer rope is the Orthodox form of a rosary, made with yarn or cord. —Trans.